The grandkids are visiting and have been here for almost a week, so any attempts at writing even a semi-serious blog have been totally wasted efforts. I would much rather be with my darlings anyway, but in order to keep my standing as a weekly blog columnist (something only I, apparently, care about) I pulled this out of the cyber-drawer where it's been sitting for a while. If you weren't expecting much, this should do it for you. I'm off now. See you soon. Nothing earth-shaking here. Just wanted to share an advertising grab I'm finding even odder than most. 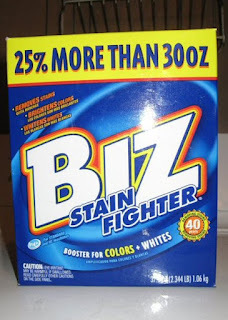 Went looking for Biz Stain Fighter the other day and it wasn't easy to find. Three stores later I finally found a box sitting alone way back on a shelf. 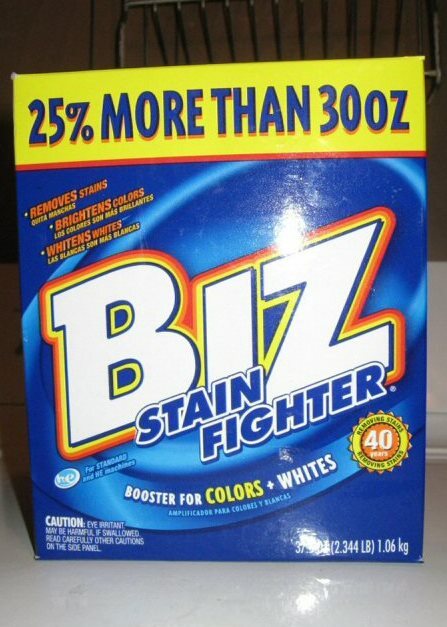 I'm trying to clean the rust stains from some old linen and lace pieces and people who do this sort of thing recommended Biz. I was busy reading the directions, and wasn't paying much attention to what else was on the box, so I didn't fully comprehend the words in the big yellow band right away. Then I did. I haven't tried it yet, so this is neither a recommendation nor a condemnation of the product inside. The truth is, I can't get past that box. "25% more than 30 oz." Did I save money by buying this size? It doesn't say that. It's simply a statement, and not even a complete one. So what am I supposed to do with that information? It's things like this that drive me crazy. I don't get along well with numbers anyway, and I've always hated story problems, so it could be there's an important message here that I'm just missing. If I were into whimsy (and I'm not saying I'm not) I might imagine that lonely box sitting way back on that dark shelf getting pretty bored. It might resort to doodling or playing number games, and maybe it got caught in the middle of one. Or maybe it was something less whimsical and more likely: Maybe the marketing team was brainstorming and someone came up with this lame attempt at drawing customers to their product. Maybe they even went so far as to produce a prototype before someone said, "That doesn't even make sense". But maybe it was too late, and some of the boxes actually got to the assembly line and onto the pallets and made it to the store shelves, where they just sat there, unnoticed, because apparently nobody really buys Biz anyway.